Rainbow Sugarcraft: Here Be Dragons! 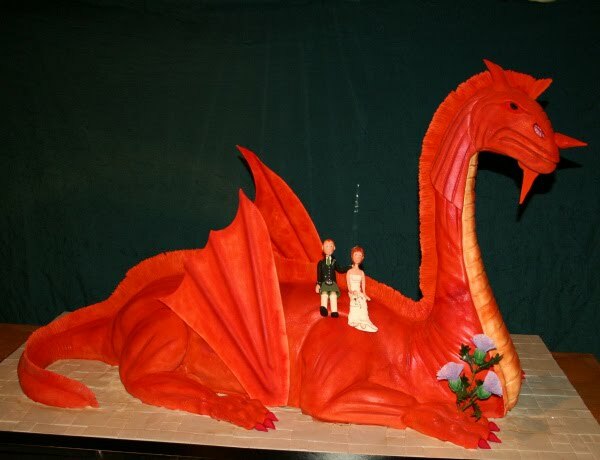 Sandra wanted to surprise her Welsh Groom so ordered a mighty Red Dragon Wedding Cake. It was quite a challenge delivering the Cake to the Dryburgh Abbey Hotel without anyone seeing him. The task was made especially diffcult as all the guests were in residence and the cake measure over three and a half feet long and weighed in around 70 lbs. We decided to disguise the dragon in a purpose made cardboard crate and once the coast was clear managed to sneak in and manouver him into the function room. 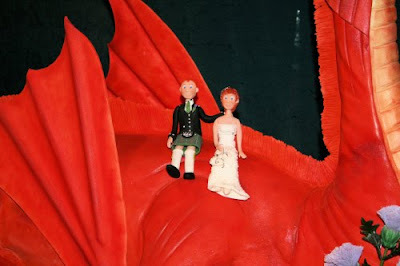 Here he was given huge sugarcraft wings and his handcrafted personalised bride and groom passengers. Sandra and her bridesmaids all piled into the Dragon's Lair to see the splendid beast. Amidst muffled gasps of astonishment and giggles, they locked the door behind them to prevent any prying guests spoiling the big surprise. It was wonderful to get such an astonished and delighted reaction to the Wedding Cake from the bride and her family. We also supplied a Scottish cake cutting sword, which the happy couple would use to slay their dragon, though we do hope they did it gently as we had grown rather fond of him during the week he took to create.